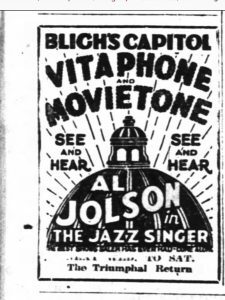 Above is an advertisement for the musical program, The Jazz Singer, at Bligh’s Capitol Theatre in Salem Oregon. This advertisement was published in the Statesman Journal on 22 July, 1928. In relation to other advertisements on the page, this one was the most eye-catching due to its boldness. A disadvantage to this advertisement is it does not have any information about the price and dates of showing. It might have been at the bottom of the advertisement, but overtime and through digitizing it’s no longer there. This advertisement is interesting, particularly because of the program. 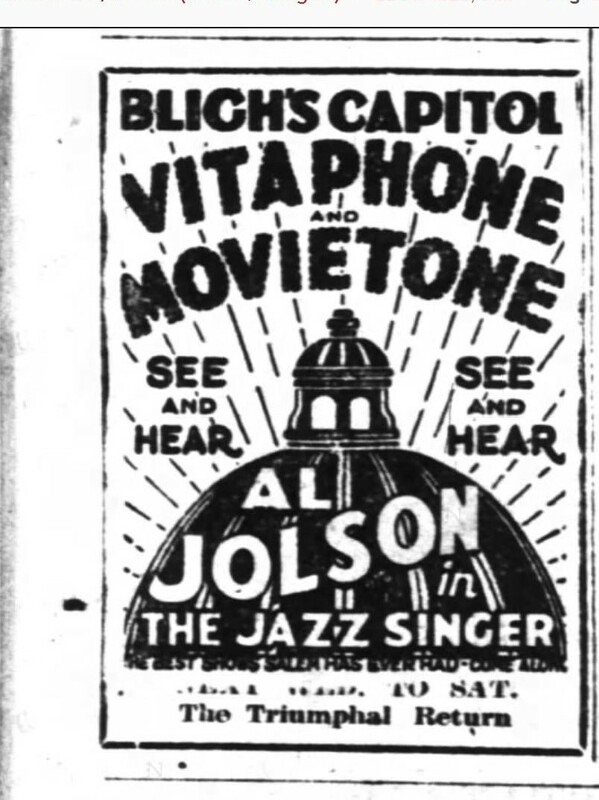 The Jazz Singer was the first feature film with synchronized speech, which explains the use of ‘vitaphone’ and ‘movietone’ across the middle of the advertisement. The exhibitor wanted the focus of the advertisement to be on the brand new kind of program viewing in order to get the maximum amount of viewers. This also attributed to the popularity of the program. The Jazz Singer, was released in October of 1927, which means this program was available in Salem in less than a year. This further illustrates the programs level of popularity, considering the population and Westward location of Salem. This program also had a big-time entertainer, Al Jolson. While Jolson was extremely popular among program goers, it is also important to acknowledge the racism embedded in the entertainment industry. Al Jolson did the majority of his programs in blackface, and at the time this was not a problem. Jolson used racial stereotypes, and was still considered to be the ‘greatest entertainer’ of the time. While blackface is not encouraged in the entertainment industry anymore, it is still important to recognize how it was sensationalized and welcomed at one point in time. 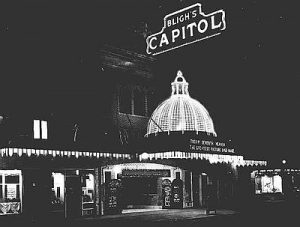 For context, Bligh’s Capitol Theatre was located on State Street in Salem Oregon in 1926. It was built in 1926, and burned down in 1935. It was then rebuilt and stayed open until it was closed in the early 1990’s, and eventually torn down in 2000. Throughout its lifespan the Theatre remained in the same location but the street names changed over time. Statesman Journal, 22 July. 1928, pg 2. “VAUDEVILLE AND MOVING PICTURE SHOW,” an advertisement in the November 27, 1909 edition of the La Grande Evening Observer describes a mixed-bill of upcoming entertainment to be viewed at the Scenic Theatre in all capital letters to grab readers’ attention. This cross-promotion of live and recorded entertainment is highly intentional. 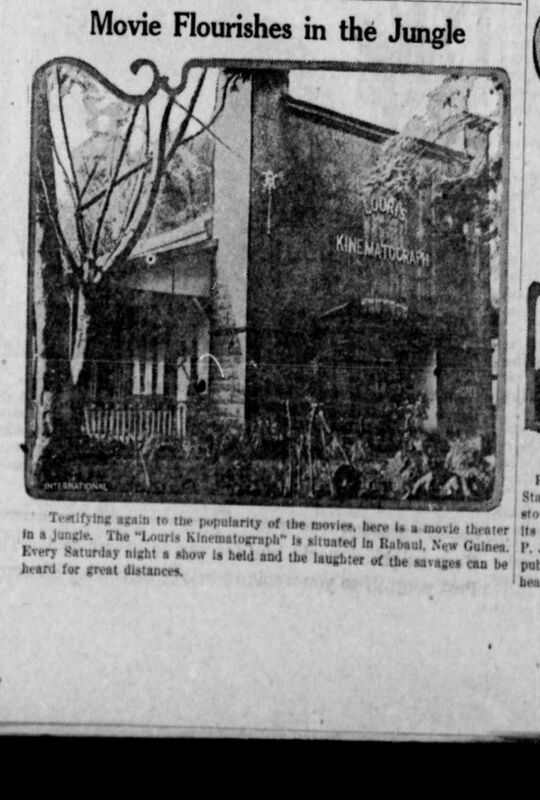 Slowik’s concept of promoting film alongside live vaudeville acts to increase audience recognition of film as a valid and celebrated form of entertainment in the early 1900s is made apparent in the La Grande Evening Observer Scenic Theatre advertisement. The advertisement reveals the double feature of vaudeville performances “O’NEAL AND MARION Burlesque on Uncle Tom’s Cabin” and “THE KENMORES. Willie and the Dolls” alongside “two reels of moving pictures.” The vaudeville performances would likely draw the crowd in for the film to follow, with hopes of building a future audience for film-only events that would potentially cost less money and require less organized planning than live vaudeville performances. In addition to the format of the Scenic Theatre’s bill of upcoming entertainment, the content itself is worth discussing. With O’Neal and Marion’s burlesque show’s titular reference to Harriet Beecher Stowe’s 1852 novel, Uncle Tom’s Cabin, an audience member would likely expect elements of blackface minstrelsy and other racially charged material. (Stowe’s ‘Uncle Tom’ became synonymously used a derogatory term describing a subservient black man.) As cited by historical records in Oregon Blue Book, “African-Americans were unequivocally not wanted.” Exclusionist and Free Soil beliefs solidified Oregon’s early attitude on race, declaring it both ‘anti-slave’ and ‘anti-black’. Material such as blackface minstrelsy would likely be unsurprising and well received in an Oregon community such as La Grande, even in the early 1900s. Examination of the Scenic Theatre’s advertisement in the La Grande Evening Observer offers primary insight into both the movement to use live vaudeville performances to draw audiences to film, as well as to the frightening reality of Oregon’s roots in racism. In this way, it is clear that live vaudeville performances had the capacity to act as agents of change towards the future, as well as pieces of historic preservation highlighting a problematic past. Beecher Stowe, Harriet. Uncle Tom’s Cabin. John P. Jewett and Company, 1852. La Grande Evening Observer, 27 Nov. 1909. Oregon Blue Book: Oregon History: Statehood to Present, bluebook.state.or.us/cultural/history/historypost.htm. Slowik, Michael. “Film Exhibition in Vaudeville: What We Learn from Keith-Albee Managers Reports.” Nineteenth Century Theatre and Film, vol. 39, no. 2, 2012, pp. 73–92. Manchester University Press, doi:10.7227/nctf.39.2.5.